Is there a method to our madness when it comes to shopping? Hailed by the San Francisco Chronicle as "a Sherlock Holmes for retailers," author and research company CEO Paco Underhill answers with a definitive "yes" in this witty, eye-opening report on our ever-evolving consumer culture. 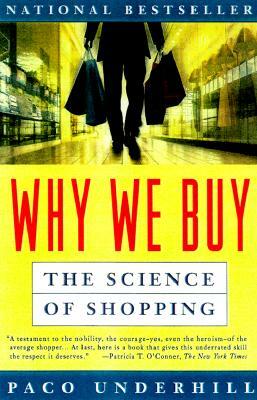 Why We Buy is based on hard data gleaned from thousands of hours of field research -- in shopping malls, department stores, and supermarkets across America. With his team of sleuths tracking our every move, from sweater displays at the mall to the beverage cooler at the drugstore, Paco Underhill lays bare the struggle among merchants, marketers, and increasingly knowledgeable consumers for control. For those in retailing and marketing, Why We Buy is a remarkably fresh guide, offering creative and insightful tips on how to adapt to the changing customer. For the general public, Why We Buy is a funny and sometimes disconcerting look at our favorite pastime.